We’re thrilled to inform you that the All-party Parliamentary Dog Advisory Welfare Group’s (APDAWG) first meeting of 2019 covers not only a very important canine topic, but one that its relating legislation is also changing & making good progress through Parliament. Pet Theft is of course a serious issue that can effect every pet owner in the UK. In this meeting the Stolen And Missing Pets Alliance (SAMPA) will talk about what’s being done within Westminster to tackle pet theft, to help change laws, what goes into writing new legislation, how you can help campaign to raise awareness of pet theft, hear tips of how to ensure your pet is kept safe & what to do if he/she goes missing & much more! 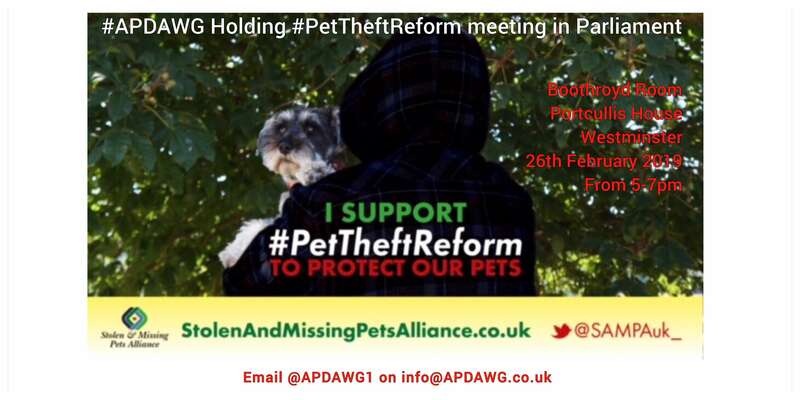 This APDAWG Pet Theft Reform meeting, which is open to everyone, will take place in their usual room, The Jubilee Room in The Palace of Westminster, from 5.30-7.30 pm on Tues 26th Feb. Due to the unprecedented popularity of our APDAWG events, we advise you to RSVP ASAP, but please reply only if you can definitely attend. Houses of Parliament, London SW1A 0AA. Please email info@apdawg.co.uk ASAP to register for this event, as numbers are limited & our events get booked up very quickly.